St. John Vianney, Who Accepted the Cross, O holy priest of Ars, as a young seminarian you encountered many obstacles on the road to the Priesthood, but you realized that to suffer was to suffer with Christ on Calvary, and so, if following our Lord meant taking up His cross, you lovingly embraced it. Your motto in life became loving while suffering and suffering in order to love. You did not get discouraged, but your strong faith united you closer to Jesus every day of your life. Oh great St. John Vianney, you know what is needed for Father_______'s salvation ---a strong faith able to accept the will of God in all things. To serve Christ, he too must take up his cross and follow Him. By your prayers, obtain for him a heart full of courage and strength. Obtain for Father_________that same courage and strength to follow Jesus wholeheartedly even if it means following Him to Calvary. Intercede for him before the Lord that he may do the will of God, obey the commandments, and loyally love the Church, the Bride of Christ. Novena Prayer: O holy Priest of Ars, St. John Marie Vianney, you loved God and served Him faithfully as His Priest. Now you see God face to face in heaven. You never despaired but persevered in your faith until you died. Remember now the dangers, fears and anxieties that surround Father _______ and intercede for him in all his needs and troubles especially console him in his most difficult moments, grant him serenity in the midst of crisis, and protect him from evil. 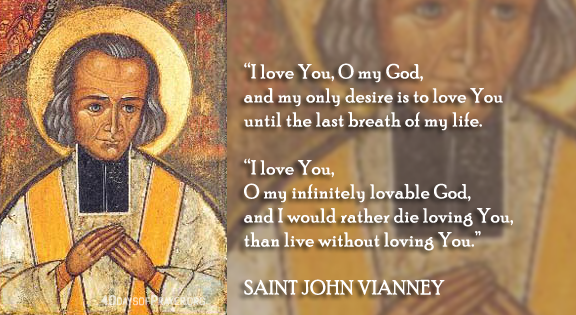 O St. John Vianney, I have confidence in your intercession. Pray for Father _______ in a special way during this novena. St. John Vianney, Full of Zeal for Souls O holy Priest of Ars, you taught men to pray daily: O my God, come to me, so that You may dwell in me and I may dwell in You. Your life was the very living out of this prayer. The divine life of grace abided in you. Your zeal for the salvation of souls was manifested by your total self-surrender to God, which was expressed in your selfless service to others. You gave of yourself unreservedly in the confessional, at the altar, in the classroom, in fact, in every action you performed. O great St. John Vianney, obtain for Father _____ the realization that God also dwells in him when he is free of sin. Remind him that the salvation of his soul is the fulfillment of his existence. Awaken in him a sense of self-giving for the salvation of souls. Obtain for Father _____, by your intercession, a zeal for souls like your zeal. May he see that God dwells in him and in his fellow men. Obtain for him from our Lord the grace to lead all men to salvation. Let your prayer be his: If you really love God, you will greatly desire to see Him loved by all the world. O Saint of the Eucharist, may your example enkindle in Father ____________ a deeper love for Jesus in the Blessed Sacrament. By your prayers, never let him doubt Christ's Real Presence, but obtain for him a firm faith rooted in the Eucharist. Help him not to be afraid to defend or preach Christ's Real Presence in the Blessed Sacrament. Obtain for him the grace to approach our Lord with simplicity of heart as he lays his soul's innermost thoughts before Jesus' Sacred Heart. Keep Father ___________________ under your continual protection, that he may be supported by your example and assistance and be faithfully devoted to Christ in the Blessed Sacrament. May his life reflect the belief of our Lord's abiding presence with us. O St. John Vianney, by the power of your intercession, give us Priests devoted to the holy Sacrament of the Altar. St. John Vianney, Greatly Devoted to Our Blessed Mother O holy Priest of Ars, your life was consecrated to the Blessed Mother. You prayed earnestly to her, entrusting your Priesthood to her care. You begged all the faithful to pray the rosary, the favorite prayer of Mary, our Mother. You summed up the reason for your great love of our Lady by saying: We have only to turn to the Blessed Mother to be heard. Her heart is all love. O great John Vianney, I ask you with all my heart through the merits of Jesus and the intercession of Mary, the Virgin Mother to make Father _______'s life patterned after that of our heavenly Mother, full of love for God and his neighbor. Obtain for him a deeper love for our Lady and a filial confidence in her. She is the person to whom he can turn in times of distress when lonely or upset or in times of temptation. Inspire Father ________ to consecrate his life to his Mother in heaven. May he know the powerful protection of Mary's Mantle all the days of his life. St. John Vianney, Lover of Sinners O holy Priest of Ars, you spent many long hours daily in the confessional. People came to you for forgiveness of their sins from far-off places. Although you despised sin, you always received the sinner with much love and forgiveness. O holy confessor of the Lord, St. John Vianney, awaken in Father ____________________ a sense of his sinfulness before the eyes of God. By your Priestly example, grant him a love of the reception of the Sacrament of Penance. Obtain for him the understanding that it is in confessing his sins that God's mercy is poured out upon him and he draws closer to Christ. Obtain for him a deep hatred of sin and the grace to resist temptation. Teach him the value of frequent confession, where he meets Jesus, our Savior, the source of all mercy and consolation. Contrite and forgiven may all those with whom he comes in contact act with that same mercy. Pray that Father __________________ always love the Sacrament of Penance. Pray that he may call sinners to repentance with his good example and lives in complete service to our Lord. St. John Vianney, Model of Purity O holy Priest of Ars, your life was a model of purity. Your life of chastity was a source of edification to all. You said that when a soul is pure all the court of heaven looks upon it with great joy. Today we are experiencing a great disregard for the virtue of purity; it is looked upon with ridicule by worldly standards. O great St. John Vianney, more than ever before, we need your prayers and help in avoiding sins of impurity. I ask you to help Father ___________________ to keep pure in mind and in body and give good example in his speech, conduct and in his faith. Obtain for him the strength necessary to combat temptations against the virtue of purity, which could lead him away from God. Unite your prayers with those of Mary Immaculate to implore God that Father ___________________ be pure in mind and heart and preserve him from those sins which are so displeasing to God. O holy Priest of Ars, your life was filled with humility. You wore an old cassock. You ate meager meals. You realized that before the throne of God, you were one of His creatures made to glorify God and praise Him in all things. You said that the first virtue is humility; the second, humility; and the third, humility. You counseled people to remain humble, remain simple and the more one is so, the more good he will do. Your simplicity of soul and your uncluttered way of life led you to sanctity. O humble St. John Vianney, when Father _____________________ forgets he is totally dependent on God for everything, intercede for him with Almighty God, to allow him to see that without His Creator nothing is possible and that he must rely on God for everything. He is his Creator, who keeps him in existence at every moment. Obtain for Father ________ the grace of humility. May his life exemplify your humility and simplicity, a life uncluttered, a life totally dependent on God. St. John Vianney, Lover of Penance and Mortification O holy Priest of Ars, you led a life of detachment from worldly pleasures. Your meals consisted of a boiled potato each day; you slept a few hours each night. But you did all of this so that you would be able to serve God to the best of your ability. Your life was portrayed by the saying: We complain when we suffer. We have much more reason to complain when we do not suffer, since nothing likens us to our Lord as the bearing of His cross. O great St. John Vianney, in these days when we are surrounded by so many comforts and pleasures, it can be so difficult for us to do penance for our sins and live a life of detachment. I resolve to offer some sacrifice today for the expiation of Father ______________'s sins and the sins of all mankind. Assist Father in accepting the cross God chooses to send him. May he embrace the life of sacrifice to which Priests are called. May he willingly offer his whole life to God! Obtain for Father _____________________ the grace to imitate the life of Christ by the bearing of His cross. O holy Priest of Ars, you lived in an age of much upheaval, in a time when men turned their backs on God. Your bishop told of a parish to which he wished to send you where there was no love. He assigned you to Ars and said that you would be the Priest who would enable the people to know the love of God. Not only did you draw these people back to God, but your saintly reputation soon spread and many people were converted to a life of holiness. You said that a good Priest, a Priest after Christ's own heart is the greatest treasure that God can give a parish. Give us such Priests! O great St. John Vianney, once again we are living in day of upheaval. There is much evil in the word. Obtain for Father _____________ the grace to persevere in his faith and never to despair. May he walk with the Lord and trust in Him all the days of his life. Obtain through your heavenly intercession, for Father ___________________ the grace of modeling his life after that of Jesus Christ, that his people will know the love of God. More than ever the people need him to be able to bring the world to Christ. Pray for Father______________ and all Priests, O great Priest of Ars.